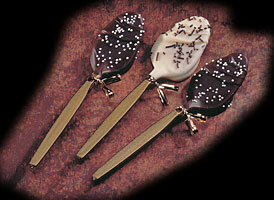 Chocolate covered stirring spoons are a delicious idea for a diy wedding favor or coffee bar treat! Also, with the large variety of colored spoons at party stores and the variety of colors you can find of the candy making chocolate wafers..they can be made to fit your wedding theme to a tee! 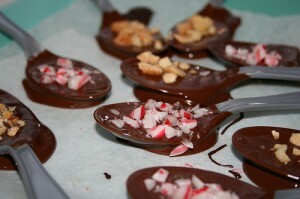 Guests will love dipping these hand dipped chocolate spoons in their favorite hot drink..from coffee to hot chocolate! Yum! Now let’s make some yummy spoons! Start by melting down your chocolate. 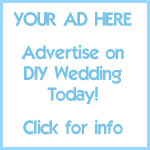 This can be done however you feel most comfortable! Some like to use a microwave or double boiler. Personally, I like to take one of my medium size pyrex glass bowls and set it on top of a medium sized sauce pan that is boiling a small amount of water. Either method you use, make sure you stir often and do not allow the chocolate to burn! 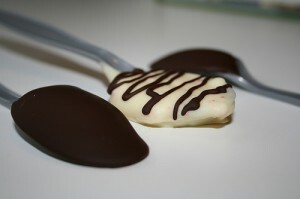 Once melted, allow the chocolate to cool just slightly so it will adhere to the spoon without being too runny. Next, dip each plastic spoon one by one into the melted chocolate (fully submerging the head) and lay them on a sheet of baking paper. 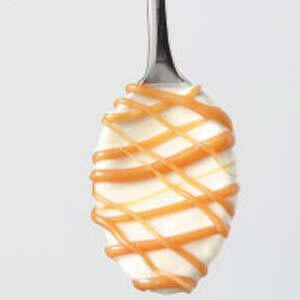 If you are going to add candy sprinkles, sprinkle them on spoons before chocolate hardens! Allow the chocolate to cool and set. 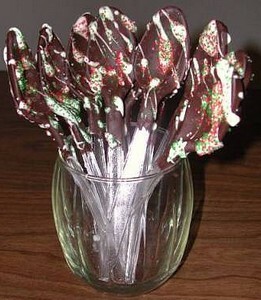 Optional – If you want to add more color to the spoon, feel free to melt another color chocolate in the same way as above, fill a parchment cone with the chocolate and pipe swirls, designs or zig zags across the head of each spoon. Once the chocolate on the spoons have completely set, wrap each spoon with cellophane and tie with a pretty ribbon. That’s it! Once completed you can either set one spoon at each place setting for a yummy favor (maybe include a small bag of hot chocolate or coffee too! ), or group in large mugs or vases near the coffee bar. 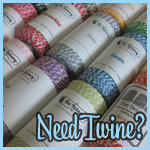 Your guests will love this thoughtful treat..and you’ll love how affordable and easy they are to create! So delicious!